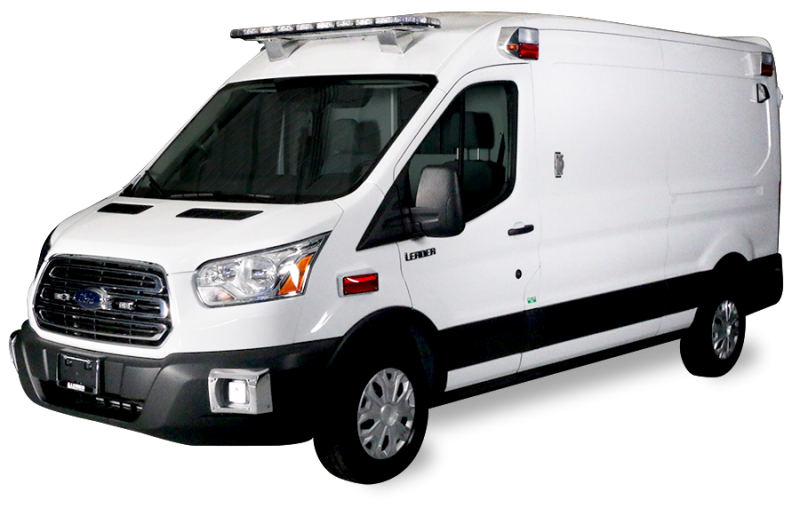 Covering the territories of Delaware, New Jersey, New York and Pennsylvania, VCI Emergency Vehicle Specialists has been selling Leader Emergency Vehicles since 2000. One of the main factors that drew VCI to the Leader brand was that they could custom tailor the design of an ambulance to suit any requests from a customer. Leader also is known for using the latest technology and applying rigorous testing processes to their ambulances and any new features. While some may say it’s “old school,” Leader vehicles have used virtually the same rugged components for over 15 years. Except for improvements in durability and reliability and, of course, chassis changes, a lot of Leader’s processes have gone unchanged because they work so well – why fix what isn’t broken? Using the latest in CNC technology, Leader’s interior cabinets are programmed and cut to .001″ accuracy. This ensures each panel will fit together flawlessly with minimal waste of materials. Each panel is then assembled using glue as well as metal fasteners, giving each cabinet the strength to withstand years of use and abuse. Leader uses only premium wood cores in their laminated panels. This insures no unsightly and more importantly, no weak spots in your cabinets and flooring! Many of the aluminum extrusions used in the construction of Leader cabinets is from dies of their own design. Rather than adapt a “bathroom” molding to your ambulance needs, Leader chose many years ago to produce molding to meet the needs of the emergency vehicle industry. In many areas, the “molding” is not only cosmetic but it is a substantial structural component of the cabinet. The molding interlocks with the top grade laminate covered plywood (NO particle board and no blow molded plastics) to actually reinforce the cabinets against the rigors of a busy call load. Door and drawer locks used at Leader are also standards of the industry and Leader is constantly pushing their suppliers to increase their quality in materials so improvements can be made on old Leader emergency vehicles as well. Leader uses a time tested and proven system made up of long life relays, circuit breakers, and toggle switches. By using this type of system, Leader is able to provide customers with the most reliable electrical system available. All of the wiring is automotive grade, over-rated for the circuit requirements, and then wrapped in sturdy heat and wear resistant conduit. All of Leaders wire harnesses are made in-house to insure the quality and reliability. In the assembly process, all crimp connectors are pneumatically crimped and critical connections are soldered. Each harness is specifically made for each vehicle to meet the needs of the selected electrical options. Standard in every wire harness are several “Option” wires for future use. Adding after-sale equipment or making rarely needed repairs is made easier as each Leader wire is printed with not only the circuit number, but also the wire’s function every eight inches. Each vehicle also comes with a set of easy to understand schematics and a wire identification call-out list with color, gauge, circuit number and function. Although the fiberglass is one of the very few items not done in-house, all fiberglass components used by Leader Industries come from their own molds and are thoroughly inspected by Leader before being accepted for delivery. Each fiberglass item is not only inspected for finish but also uniform thickness, insuring the maximum strength at a minimum weight. Leader is one of a few, if not the only manufacturer, to include a grounded metal mesh within their fiberglass ambulance tops to insure proper operation of any roof mounted antenna arrays. Ambulances painted by Leader are first inspected for dings and dents. These are most often removed using a “paint-less” removal system. The area(s) to be painted are then carefully masked off and hand sanded (NO chemical etching is done in this process). Air Quality compliant commercial coatings are used to bring any paint scheme to life. Hand sanding, buffing and edge detailing is also performed prior to delivery to provide a paint job that will last the life of the vehicle. Leader batteries are always readily accessible for testing, cleaning and periodic replacement. Leader vehicles include a separate set of batteries that are constantly charged by the vehicle’s electrical system in case the regular battery becomes drained. A simple flip of a switch “jump starts” the vehicle to complete the call. In addition, a tell tale red light illuminates and stays on to alert Fleet Service there has been a problem with the batteries. Even with something as simple as the plywood sub floor, Leader uses only top grade “solid & joined” plywood 23/32″ thick. What this means is there is zero chance of a soft spot developing in the floor due to a void in one or more of the plies. Other manufacturers use Marine and that applies to the adhesive used to bond the plies. There still may be voids waiting to fail using the marine grade method. Leader also uses an automotive grade body filler to fill in depressions from the securing screws as well as the “puzzle piece” type of joint where the two sheets mate to form one solid sub floor! Leader even takes the sensitive electronic devices that standard crews use into consideration. Leader uses an RF shielded ballast in the fluorescent lamps so they don’t interfere with any communications gear or patient diagnostic telemetry equipment. “A happy crew is a contented crew”. Leader vehicles include electric remote mirrors, cruise control on a tilt steering wheel, and AM/FM CD player for between calls and staging for long hours. Crews also enjoy Leader’s cloth upholstered seats that actually recline due to a redesigned wall between the cab and the patient compartment. Leader vehicles have always had full travel in the cab seats, this is just something extra Leader provides for a crew’s comfort. A comfortable crew is more likely to respect the vehicle they are in for eight to ten or more hours. All crews and patients will appreciate the heavily tinted windows in the patient compartment as well for safety and privacy. The tempered Masonite® panels used to cover the rear doors on Leader Type II’s resist rain and impact to last longer. The wiring gauge and insulation rating in all Leader circuits is well beyond any regulatory agencies requirements. Leader floor covering used in the patient compartment is not only highest grade for durability but also installed in such a way to virtually eliminate any fluid entry into unreachable (and un-cleanable) areas. The back board storage compartment in the Type II’s is all welded aluminum, not just a frame at the opening that is very common in other manufacturers. No matter how hard a crew slams the back boards back in, there will never be any damage to the cabinetry. At the head end of the squad bench on the standard Type II’s there is a secure place to keep portable D or E oxygen tanks. No cumbersome straps or buckles to fumble with, just a quick release lever to remove the tanks. Perhaps the one feature that sets Leader apart from all other Type II’s is the location of the control switches, gauges and siren controls. They are all over head within easy reach of the driver and well out of the way of sodas, coffee and other non-electrically compatible items. Just above the cab overhead on a separate swing down board resides the majority of the flashers, strobe packs, relays, and circuit breakers, making servicing a rare electrical problem easy and very accessible. Locating the ambulance electrical switches, gauges etc. to the overhead also frees up space in the cab to remove the engine cover for routine servicing. Your crews will appreciate the additional room typically occupied by the switch panel commonly used. Obviously, if needed, Leader can meet any needs for a variety of storage or equipment mounting options for MDT’s, multiple radio mounting or just a place for gloves, clip boards and a Big Gulp. Right over the driver and passenger seats there is a pair of speakers mounted and pre-wired in the overhead ready to be connected to a crew’s communications radio(s). Even the siren speakers on a Leader were chosen not only for sound output but for easy serviceability when needed. Need to wire in something that wasn’t planned on? Leader includes several “option” wires running to almost every spot on the vehicle. Consult the wiring call out sheets or make a quick call to your Leader dealer and you’ll be up and running in no time with a minimum of hassle.